It’s finally here! Herein is contained the Book of the Month review of Martin Caidin’s Cyborg, much delayed, and sent out with the heartfelt apologies of the two tardy losers who post this blog, EG and OG. As always, beware! There are SPOILERS within! If you haven’t read the book and want to and don’t want to know anything about it yet, now is the time to bale! If you’ve read the book and want to participate, we’d love it if you left a comment or 12 at the bottom of the post. Now, if we are all set, please settle down, sit a spell, kick your shoes off, and let’s take a look at Cyborg! And, so goes the original opening of “The Six Million Dollar Man,” the TV series based on this month’s book, Cyborg by Martin Caidin. Cyborg is indeed the tale of Steve Austin, but a different one than most of us who watched the series are used to. Not completely different… but different enough. Air Force Colonel Steve Austin is a former astronaut who had become a test pilot. During a test flight, there is a catastrophic accident, leaving Steve Austin barely alive. As a result of the accident, he loses his left arm, both legs, and his left eye. But he survives. Dr. Rudy Wells, Austin’s physician and friend, is approached by Oscar Goldman of the Office of Strategic Operations (OSO), with a proposition. Using the cybernetic breakthroughs of leading researcher Dr. Killian, Steve Austin could return to a relatively normal existence, not a crippled shell of the former man. Wells, knowing that Austin would rather die than live in his condition, decides to allow the procedures. We follow as Austin is implanted with his cybernetics and given a great amount of detail about how they work, their advantages, and their limitations, as Steve Austin becomes the first true Cybernetic Organism (or Cyborg). As Austin recovers from the procedures, we also follow his mental state, from his feelings of less than a man, to freak, moving toward acceptance of his state, and even to a place of gratitude for the advantages he has. The reader is treated to the testing of the cybernetics of Austin, as he learns his abilities and limitations. Before long, the OSO decides that it is time for Austin and his new cybernetics to serve their country, and begin sending him out on missions. This first is simply a recon mission, but an amazingly dangerous one, infiltrating a secret Russian base near the southeastern perimeter of the United States. Shortly after a successful completion of that mission, Austin is sent into the Middle East to steal a Russian MiG-27. EG: This is the first book we’ve taken a look at that has some “hard” science fiction elements to it. That is, it has really in-depth scientific description and explanation, focusing on theoretically accurate possibilities for the future of real science. Not simply, “Yeah, we gave him robot legs!” OG, I’m really interested in your reaction to this book, since you’ve admitted to having less experience with science fiction in book form. OG: You’re right, I have. And I’ve really been looking forward to bringing some hard sci-fi into my diet. I love reading about new developments in technology and other futurist type writing, so I think I’d enjoy that stuff within the context of a greater work of fiction. That said, in a novel, I think I can only truly enjoy it if it’s been woven seamlessly into the narrative. My problem with Cyborg was that it didn’t handle that balance properly. My understanding is that before writing fiction Martin Caidin was an aviator or aeronautics engineer of some sort. That doesn’t surprise me in the least because many of his science-based passages were so dry that they chapped my lips. That difficult reading (and, as short as this book is, I really did have a hard time slogging through it) only had a real payoff in terms of narrative as Steve began to deal with the psychological implications of what he’s become and his upgraded body. And, while that character stuff was much darker than I expected from the source material for “The Six Million Dollar Man,” (at least I don’t recall any scenes where Lee Majors attempts suicide!!!) it made the earlier stuff worthwhile because Caidin really forces you as the reader to understand how the “bionics” would work in conjunction with the body and therefore puts you squarely inside Austin’s head. EG: That is true. As for the character, no, in the TV show, Steve Austin never attempted suicide. I’ve read some articles that refer to the Steve Austin in the book as “bloodthirsty,” but I don’t think of the character in that way. To me, he is what I would call more “militaristic.” He has a job to do, he has been trained and prepared to do that job, and he does that job. In that frame of mind, in those situations, moral debate is left for a later time, perhaps by other people entirely. 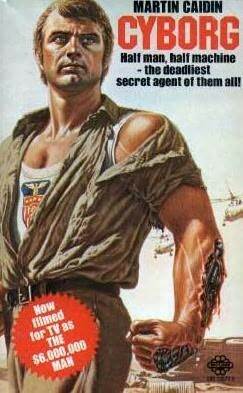 And, the description of the cybernetics, to me, actually helps fill out Steve Austin as a character a bit. Instead of seeing the cybernetics as an arm and legs, they very much became more “tools” in my head. For example, when they talked about the limitations of the legs in side to side movement, or when they described the arm as a piston-like sort of battering ram, I saw them more clearly as tools of the man, rather than a part of the man himself. Steve Austin was being equipped. Modifications are even made from mission to mission. The science-based passages helped cement that in my mind. OG: Well, I can see that. I did like all of that stuff, but it could have been done so much more fluidly by another writer. Caidin, to me, seems like the prototype for Michael Crichton, someone I feel does a better job of mixing the sciency exposition with the story and character. Well, from what little I’ve read from him, that is. EG: I can’t argue with that. It was infinitely easier to read through, for example, Jurassic Park (you did know that was a book before it was a movie, right OG?) than it was to get through Cyborg. I gotta warn you though, my friend – a lot of hard science fiction suffers from this same problem. OG: Well, yes, Mr. Smarty Pants, Jurassic Park and The Lost World happen to be two of the Crichton books that I have read. Anyway, what might have worked better from a storytelling point of view would be to start the novel in first person following the surgery as Steve begins to deal with what has happened and then, through third person flashbacks (better) or through conversations with one of the three exposition-mad characters in this book (worse), we could slowly learn about the accident and the technology that was integrated into his body. That way you dole out the science in bite-sized chunks that also serve the greater story. Instead of what you have now, which is kind of like drinking a gallon of NyQuil prior to eating a delicious piece of cake. EG: Yeah, I went in expecting something closer to the TV show, but instead I got a hard science fiction book that turned into a spy thriller. And, being totally honest, I’ll admit – I was very happy once we moved beyond the hard science fiction and into the spy stuff. I didn’t dislike the hard SF, it is just that, as you mentioned, long sections of pseudo-science technical explanation and testing can become…tedious. Getting to the application of Steve Austin’s cybernetic enhancements was much more interesting. Perhaps Caidin could have focused on each of the cybernetics as they were about to be used, giving the explanation, and then immediately going into an application. OG: I think so. And, I too welcomed the fact that this wasn’t just a big hunk of American cheese with dubious “science” on top. I mean, the TV show is cool for what it was, but had that been all the book was, it might have been easier for me to get through, but wouldn’t have been as interesting. That said, I wouldn’t have minded in the slightest if Caidin had dropped the dusty realism just long enough to give our boy that cool telescoping eye from the show. A camera is fine and all and perhaps more plausible. But, come on! We’d all gladly suspend some disbelief in favor of a telescoping eye! By the way, do you recall Steve Austin having a dart-shooting finger in the show? EG: No, Steve didn’t have the dart-shooting finger. I also found the science-based book version of Steve Austin more interesting than the Steve Austin of TV. I liked that he couldn’t run at super speed or bend steel girders. I was even fascinated by the explanation of his endurance abilities – that the heart and lungs that supported him when he was all man actually supplied much more for him after his accident, since they didn’t have to “feed” one arm and two legs. I honestly didn’t miss the telescopic eye at all. OG: You didn’t miss the telescopic eye!?!? Oh man, I don’t think there’s a single book I’ve read in my life that wouldn’t benefit from a telescopic eye or two. I mean, imagine if Atticus Finch had had one. Well, I don’t know what he would have done with it, but it probably would’ve come in handy when he had to shoot the rabid dog. Of course, he did all right in that regard without it. But still. Okay, so I majorly digressed. Anyway, yeah, I also started to turn the pages at a faster clip once it became the spy thriller that it became. Again, it reminds me of another writer and, based on the characterization of Steve Austin that Caidin gives us, it’s a writer I wouldn’t be surprised to find he was an avid reader of. That would be Ian Fleming. And, this is not just because of the obvious comparisons to James Bond in terms of secret missions, cool gadgets, etc. Fleming also began as a technician in the field he later wrote fiction about and also wrote about a dark, manly man character that dispenses with human life without passion and views his employer with more than a smidgen of cynicism; a character who seems to hate himself while being simultaneously confident in his ability to do the job at hand. I will risk beating the proverbial dead horse here to point out that the primary difference between Fleming and Caidin is that Fleming made the transition from practitioner of spy-craft to fiction writer much more smoothly and entertainingly than Caidin did from aviator to sci-fi novelist. My hunch is that Caidin’s following three Steve Austin novels improve without having to do all the heavy lifting that’s taken care of in this one. Do you have any interest in reading any of those? EG: I think we can plan on putting those on a list for a future date. EG: Maybe we’ll get through one in less than two and half months! EG: For this book, though, despite the dry portions of theoretical science, I enjoyed it. And, though it seems somehow a sacrilege to give the inspiration of this little club a less than 5 Running Steves rating, I’m gonna have to go with 3 1/2 out of 5 Running Steves. OG: Yes, it does seem like a sin, but I’m gonna go just a bit lower and give it 3 Running Steves. Hey, I don’t know if you caught any of NBC’s “Bionic Woman” re-tread debacle, but I kind of wonder if the makers of that show read Cyborg prior to putting it together. Now, they were hampered by some bad writing and not great casting. Also, they went a little too “Battlestar” on the thing and basically drained any fun out of what should be a little fun on principle alone. That said, they did try their hand at injecting some of the melancholy and moral quandary of becoming a cyborg (against your will) that you only really get from this book and not from the previous TV incarnations of these characters. And, while they failed completely, I can see better what they might have been attempting and it makes me wonder if it couldn’t have worked, or if a “Six Million Dollar Man” remake would be worth a thought. NBC certainly won’t be trying that any time soon. But, it makes me wonder. Maybe some day. EG: I did see the first four episodes of that series. I don’t know if the book inspired it at all; I would say it was just the writing staff infusing a common “angst” into the show for the purposes of conflict. (Get ready, because I’m about to go all geeky trivia here!) I would say that the issue of melancholy and moral quandary was actually handled pretty well in the TV film “The Return of the Six Million Dollar Man and the Bionic Woman,” in which Steve Austin’s estranged son was in a similar crash to his father, and his father asks OSO to implant bionics in him. Afterwards, he deals with the issues of not wanting the bionics, particularly because of his feelings toward his father. He even has to be counseled about it. I remember liking the movie… but it has been 20 years since I saw it. To further my geeky cred, though, there was another reunion movie a couple of years later called “Bionic Showdown,” and it starred a bionic Sandra Bullock. I remember it stunk though, a lot, in spite of my crush on Sandra Bullock. And, I don’t think the near 20 years since my last viewing will change THAT opinion at all. OG: Wow. “Return of…” sounds like a Netflix candidate for me. Awesome. In that vein, I must say I’m excited at the forthcoming “$40,000 Man” about an astronaut involved in a terrible accident and is then rebuilt by the government on a shoe-string budget. Could be some comedy gold in there and maybe distract Jack Black away from any Green Lantern project he may have been thinking of in the past. EG: Uh… yeah. You know, I have not been thrilled at the thought of any of these comedies that have been proposed over the years, be it the Jim Carrey “Six Million Dollar Man” or this one. Then again, there haven’t been all that many comedies that have looked good to me in recent years. But, if it keeps Jack Black away from Green Lantern, well, I’m all for it. OG: Well, I think that just about does it. Onward and upward. And, dear readers, you should know that we here at the SABC are working feverishly to make sure we get “Dune” read and discussed in time for the end of June, beginning of July. We look forward to that and hope to see you in the comments section on this one or the next!